With today’s announcement of Microsoft’s intention to acquire Skype, subject to regulatory approvals, Skype has received the endorsement required to be considered a long term, viable and stable service addressing both consumer and enterprise markets. Skype will continue as a brand and an independent business unit within Microsoft. There is significant value when your brand name has become a verb in the English language (and one that translates readily to all other languages). Skype has a strong basic revenue generating business; at this point it should be profitable but certainly has had good EBIDTA. Skype now has 170 million active users (in the past quarter), as many as 30 million online concurrently at its daily peak and growing the accounts at a rate of over 600,000 per day. Outlook is a key initial application for integration into current Microsoft products; Microsoft Lync will be taking advantage of Skype’s underlying technology where appropriate and feasible. Keep in mind that Microsoft has bought a communications software company; one of the biggest challenges will be the integration of the software development activities across what has to be at least two different product management and software development cultures. Microsoft brings to the table a new level of business process and product management expertise from which Skype will benefit significantly. Only Microsoft has the resources – technical, product and business – that can be leveraged to justify an $8.5B buyout price (and give the current investors ~150% return on their investment over 18 months). With opportunities to enhance Office products, add technology to Microsoft Lync and complement other collaboration product such as the Sharepoint platform, they can readily get their investment back within a few years. Skype has found a permanent home. Skype can now focus totally on product and service development without the distraction of seeking financing (and the associated endorsement). How will the two companies’ instant messaging services be brought together? Skype chat offers a richer chat experience, especially given the ability to rapidly escalate to a superior voice and video conversation and to provide complements such as file transfer. What will happen to the Skype Store and associated hardware? While Skype has supported and sold products from several hardware vendors, Microsoft’s limited hardware offering (of mice and keyboards) is sold via traditional PC hardware retail distribution channels. Yet much of the hardware has been designed, with assistance from the Skype-certified program, to take full advantage of Skype’s inherent technology. Skype has been attempting to address the large enterprise market with its Skype Connect program; yet we have heard of no successes. Microsoft Lync is a large enterprise product that can probably take advantage of Skype’s inherent technology while delivering an offering that meets the concerns of enterprise communications managers. However, what will Skype be doing to support the small to medium business market – where over 35% of its users say they are using Skype in business? What impact will the time required to deal with regulatory issues be on the development and launch of upgrades and new products ? We were told at the press conference no road map will become available until these regulatory issues have been addressed such that the acquisition can be completed. Yet innovation, business development and product releases must continue during this period. Can we still expect to see evolution of the Facebook relationship in some way that supports real time conversations via Facebook? Since Steve Ballmer showed up on stage at RIM’s BlackBerry World event last week and is now deeply associated with Skype, can we expect to see a carrier-agnostic Skype client on BlackBerry devices? Or would that be too much conflict with Windows Phone? Bottom line: while there have been overlapping products (such as Live Messenger and Skype Chat) there is so much synergy here that it’s going to be interesting to see what product evolution occurs over the next year and how Microsoft integrates an acquisition with what has become a brand onto itself. Steve Ballmer can be thankful that there was no Yahoo acquisition and that the Skype opportunity has come about with so many more obvious benefits. One other benefit for Canadians: the Canada Pension Plan Investment Board cleared about $500MM on the deal above their initial $300MM investment 18 months ago. Dan York: The End of the “Skype as Bandit” Era where Dan provides an interesting commentary on the barriers Skype has overcome, the Skype experience and the people behind Skype. Dan has blogged more about Skype than any other topic; his employer, Voxeo, lives and dies by Skype, especially the Skype chat. 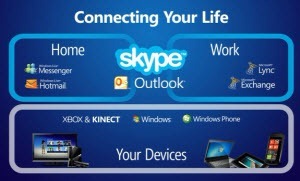 Alec Saunders: Does Microsoft’s acquisition of Skype change anything? where he talks about the impact on carrier relationships, video calling and handset manufacturers. 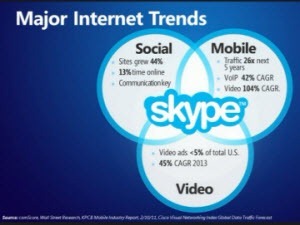 Phil Wolff, Skype Journal: What Skype’s partners can expect from the deal and Why did Microsoft buy Skype?